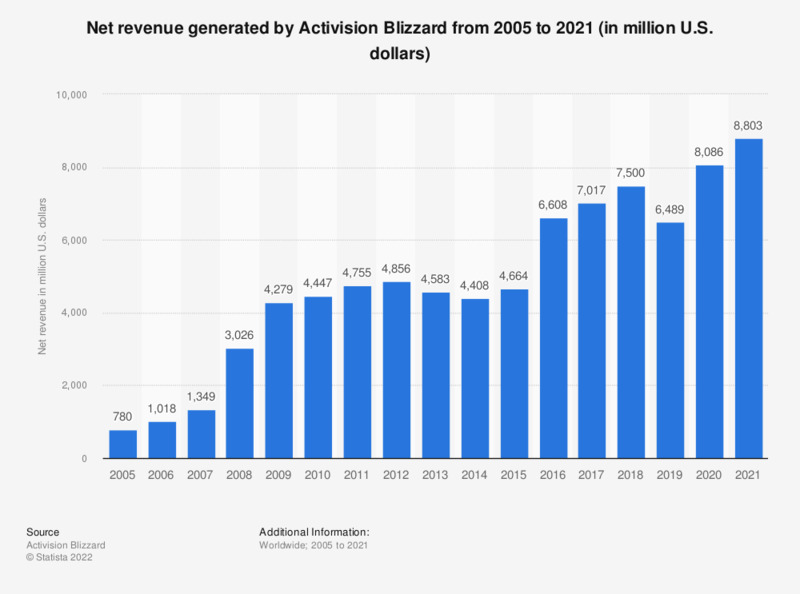 This graph depicts Activision Blizzard's net annual revenue from 2005 to 2018. In 2018, Activision's annual revenue amounted to 7.15 billion U.S. dollars. Activision Blizzard publishes games such as Call of Duty, Guitar Hero, StarCraft and World of Warcraft. Alongside WoW that continues to successfully sell new expansions packs for the game, Call of Duty is another profitable title carried by Activision. The franchise has sold millions of copies in its long lifetime. As for Activision itself, the company managed to secure a spot in a ranking of leading global companies in 2017, based on gaming revenue. In 2008 Activision and Vivendi Games were merged to form a new company called Activision Blizzard. Revenue figures for the years preceding the merger (2005-2007) refer to Activision prior to the merger. Figures other than for 2016 and 2016 come from Activision Blizzard's earlier financial releases.